THE INCREASING number of Chinese citizens living, working, and travelling abroad has created an obligation for the People’s Republic of China (PRC) to protect them. The Chinese leadership had previously accepted that, in most cases, other powers would evacuate Chinese citizens along with their own from situations of unrest abroad. But this has changed in the last decade, leading to new policies and capabilities which have in turn generated new expectations among the Chinese population. This phenomenon can be explained as the response of a rising power needing to protect its people and interests overseas as its influence expands. It could also be seen as a justification for the projection of power to underwrite China’s growing stake in world affairs. A recent and highly nationalistic genre of Chinese movies uses the former to explain the latter, in a clear move to establish such operations by the People’s Liberation Army (PLA) as ‘the new normal’ for both domestic and international audiences. China’s 1982 Constitution expresses the state’s intention to protect its people and interests abroad. But it didn’t have the capacity to enforce its policy of Overseas Citizen Protection 海外公民保护 until this century. The stimulus for change arrived in 2004, when fourteen Chinese workers were killed in Afghanistan and Pakistan. The domestic uproar caused the Chinese Communist Party (CCP) to acknowledge that large numbers of Chinese were living in high-risk environments overseas. As a study by the Stockholm Peace Research Institute (SIPRI) reveals, China started to conduct small-scale evacuations using non-military means to extract citizens in times of crisis or disaster from the Solomon Islands, Timor-Leste, Tonga, and Lebanon in 2006; Chad and Thailand in 2008; and Haiti and Kyrgyzstan in 2010. Prior to this, the only evacuations of note had been from Indonesia in the mid-1960s and Kuwait in 1990. The largest Chinese evacuations to date occurred in 2011, during the Arab Spring uprisings, when China retrieved 1,800 citizens from Egypt, 2,000 from Syria, and 35,860 from Libya, along with 9,000 from Japan after the Tohoku earthquake. According to SIPRI, the 48,000 Chinese evacuated in 2011 equalled more than five times the total number evacuated between 1980 and 2010. The evacuation from Libya was the first to significantly involve the PLA, largely in a coordination role, with limited assistance from the PLA Air Force and the PLA Navy. This operation saw 35,860 overseas Chinese evacuated over twelve days using seventy-four civilian aircraft, fourteen ships, and approximately one hundred buses. This gave China’s military reason to purchase more amphibious and airlift capability for contingencies where civilian charter would not be possible, such as in land-locked countries or higher threat environments. The evacuation from Yemen in 2015, carried out exclusively by the military, was the first time the Chinese navy had evacuated citizens of other countries as well. Between 30 March and 2 April 2015, the naval command diverted a Chinese flotilla of three PLA Navy vessels from a counter-piracy mission in the Gulf of Aden to the port of Aden. They evacuated 629 Chinese nationals and 279 foreign citizens from fifteen other nations to Djibouti. Chinese observers viewed the operation as a successful demonstration of the navy’s new rapid-reaction capabilities, developed through missions in the Gulf of Aden and off the Somali coast. As China’s state and non-state overseas interests have grown, so have the military’s ability to protect them and the expectations of an expanding, social media-savvy middle class that it will. The geostrategic requirements of Xi Jinping’s Belt and Road Initiative are reflected in China’s Military Strategy 2015, which required the PLA to develop a force structure able to ‘protect the security of strategic Sea Lines of Communication and overseas interests’. Accordingly, the Central Military Commission decided to expand the PLA Marine Corps from 20,000 to 100,000, with many stationed overseas. A significant portion of these marines will be based at China’s first declared overseas military bases, in the port of Obock in Djibouti, and more are likely to be based at Gwadar in Pakistan. They will protect Chinese oil imports from the Middle East at strategic nodes along the Belt and Road. The Marine Corps and bases are part of China’s strategy of ‘far seas protection’ 远海护卫, which requires the navy to safeguard overseas interests, including resources, strategic sea lanes, overseas citizens, investments, and commercial entities. It has led to the development of a blue-water navy capable of operating globally with aircraft carriers and amphibious capabilities. As China’s security posture and foreign policy become more assertive, stories about evacuation operations communicate these capabilities to the Chinese population and to the world. The 2017 blockbuster Wolf Warrior 2 战狼II, set in an unidentified war-torn African country (in a loose reference to the Libyan evacuations of 2011), became Chinese cinema’s highest earning film ever. It tells the story of a Chinese special forces soldier who comes out of retirement to fight Western mercenaries and facilitate the evacuation of a group of distressed Chinese. China’s official foreign policy is that of non-interference in other nations’ affairs. The movie’s tagline suggests the very opposite: ‘Whoever offends China will be killed no matter how far away the target is’ 犯我中华者虽远必诛. The final frame of the movie reinforces the expectation that China will use its power to protect its increasing interests abroad. 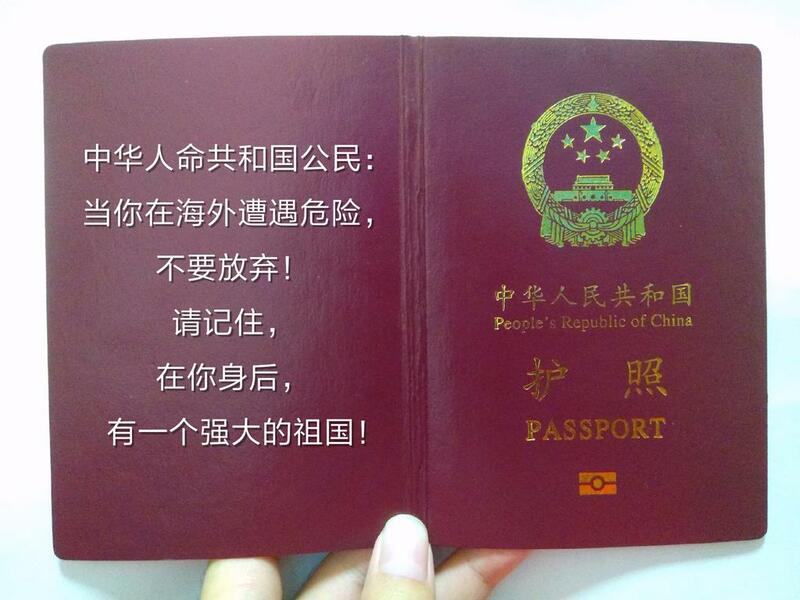 On the back cover of a PRC passport, the following is written in Chinese characters: ‘Citizens of the Peoples’ Republic of China: When you are in danger overseas, don’t give up! Remember, behind you, there is a powerful motherland’ 中国人民共和国人民：当你在海外遭遇危险，不要放弃！请记住，在你身后，又一个强大的祖国. In 2018, the movie Operation Red Sea 红海行动, directed by Hong Kong filmmaker Dante Lam, was presented in Chinese cinemas as part of the celebrations of the ninetieth anniversary of the founding of the PLA. It depicted an even more dubious representation of a Chinese evacuation operation (apparently based on the evacuation from Yemen in 2015). The movie tells the implausible tale of a team of eight Chinese ‘Sea Dragon’ Marines who are deployed into the desert of a fictional African country (‘Yewaire’) during a coup d’état in search of one Chinese hostage, creating an impressive trail of destruction, engaging in a tank battle, and leaving some of their team killed in action. The real evacuation from Yemen in 2015 saw around 900 evacuees being loaded onto three PLA Navy ships in the shortest time possible. To my knowledge, this occurred without any combat, which is obviously the preferred outcome in such missions. The movie apparently sought to be more realistic and less jingoistic than its immediate predecessors. It is certainly more violent. Professor Song Geng of the University of Hong Kong noted that ‘Some of the fans of the film have no experience of going abroad. The film caters to the fantasy of the common people as China’s economic power rises … [they are] longing for the renegotiation of China’s place in the world.’ Film critic Guo Songmin was less impressed: ‘Frankly speaking, in these several movies, China has imagined itself as another US’. The PLA has had no significant combat experience since the Sino-Vietnamese war of 1979, and this is viewed as a vulnerability by the PLA. Such films provide a counter-narrative of combat readiness to address this sensitivity. Recent Chinese war movies also showcase some of the PLA’s latest military equipment. The Chinese Navy provided significant assistance to the filmmakers of Operation Red Sea, including the use of a frigate and an amphibious ship. The Army provided similar support for Wolf Warrior 2, as did the Airforce for Sky Hunter 空天猎. Chinese naval expert Li Jie believes that these movies aim to ‘generate pride in the nation’. As the PLA’s capability to project force and protect Chinese citizens overseas continues to grow, so does the Party’s readiness to use the policy of Overseas Citizen Protection, and the Chinese people’s expectation that they will do so. As China’s global interests, diaspora and footprint continue to expand, this may result in unexpected frictions when Overseas Citizen Protection is applied to situations outside China’s traditional core interests. One example would be a recurrence of the anti-Chinese riots experienced in Tonga and the Solomon Islands in 2006, and Papua New Guinea in 2009. Significant numbers of overseas Chinese are often at risk in Melanesia, where traditional partners (such as Australia, New Zealand, or the United States) expect to provide evacuation forces and, if necessary, stabilisation support. Without adequate preparation, clear communication, and shared understanding, an evacuation operation by the PLA in the South Pacific could contribute to, or generate, unintended consequences. Such a development could be disadvantageous to the host nation, its traditional partners, and China. This concept has been described elsewhere as ‘accidental friction’. Shaio H. Zerba, ‘China’s Libya evacuation operation: A new diplomatic imperative—overseas citizen protection’, Journal of Contemporary China, vol.23, no. 90 (2014): 1093–1112, online at: http://dx.doi.org/10.1080/10670564.2014.898900, accessed 28 September 2014. Mathieu Duchâtel, Oliver Bräuner and Zhou Hang, Protecting China’s Overseas Interests: The Slow Shift away from on-interference, SIPRI (Stockholm International Peace Research Institute) Policy Paper no.41, Stockholm: SIPRI, June 2014. Tang Danlu, ‘Spotlight: Chinese navy succeeds in 1st overseas evacuation mission for foreigners, Xinhuanet, 4 April 2015, online at: http://news.xinhuanet.com/english/2015-04/04/c_134124700.htm. An Gang, ‘Operation Evacuation: Chinese navy vessels extricate citizens from the Yemen crisis’, Beijing Review, 23 April 2015, online at: http://www.bjreview.com.cn/world/txt/2015-04/20/content_684109.htm. Chinese war movies in recent years have become more nationalistic and explicit. These have include The Taking of Tiger Mountain 智取威虎山 (2014), Wolf Warrior 战狼 (2015), Operation Mekong 湄公河行動 (2016), and Sky Hunter 空天猎 (2017). Most recently, they have featured the PLA operating abroad in reference to overseas citizen protection operations in Wolf Warrior 2 (2017) and Operation Red Sea (2018). Given that all movies must be approved for release by the CCP, this is a significant trend. Translated by Graeme Smith 10 December 2017. The last character, 诛 zhu, can mean ‘kill’ or ‘execute’ but most often it means ‘punish’. Translated by Shaun Gessler 16 November 2017. Image can be found in Mandarin at: https://pbs.twimg.com/media/DHCbD4xXkAE7zLp.jpg. Liu Yujing, ‘Can China’s latest military blockbuster Operation Red Sea strike a chord with the West?’, South China Morning Post, 9 March 2018, online at: http://www.scmp.com/news/china/society/article/2136409/can-chinas-latest-military-blockbuster-operation-red-sea-strike. There was a brief maritime skirmish by the PLAN against the Vietnamese Navy in the Spratly Islands in 1988 but this is not viewed as significant combat experience. Charles Clover and Sherry Fei Ju, ‘New crop of Chinese war movies focuses on present-day geopolitics’. Peter Connolly, ‘Australia engaging China’s new foreign policy’, Center for Oceania Studies Working Paper no.8, Guangzhou: Sun Yat-sen University, 20 June 2015, online at: http://ssgm.bellschool.anu.edu.au/sites/default/files/uploads/2017-05/working_paper_-_connolly_-_engaging_chinas_new_foreign_policy_in_manadarin_-_sysu_-_20_jun_2015.pdf. Peter J. Connolly ‘Engaging China’s new foreign policy in the South Pacific’, Australian Journal of International Affairs, 29 June 2016, online at: http://dx.doi.org/10.1080/10357718.2016.119480. Peter Connolly, ‘Accidental friction on the Belt and Road’, The Strategist, ASPI, 5 June 2017, online at: https://www.aspistrategist.org.au/accidental-friction-belt-road/.